After weeks of rioting and unrest in the country, Kenyan President Mwai Kibaki and the opposition leader Raila Odinga shook hands yesterday and agreed to try to end the crisis that has led to the deaths of 600 people and the displacement of 250,000. But the tribal violence sparked by the East African nation’s disputed elections last month amid claims of vote rigging has already caused $1bn damage to the economy. There are fears that Kenya’s image as an oasis of calm in the continent, and the perfect holiday destination, has been destroyed. The tourism industry, which was Kenya’s biggest foreign currency earner by far, bringing in an estimated $1bn per year, has been described as “dead” by the Kenyan Association of Tour Operators. Kenya was a popular destination for British honeymooners; put off by scenes of tribal violence, tourists have stopped coming. Nigel Vere Nicoll, the chief executive of the UK-based African Travel & Tourism Association, said around 20,000 jobs are under threat in the hotel industry, and a further 120,000 jobs that depend on the sector. As each job supports 10 people in Kenya, where the average salary is just over a dollar a day, this loss cannot be underestimated. “Tourism is the biggest revenue earner in Kenya,” Mr Vere Nicoll said. He said that even if the political leaders come to an agreement to hold another election, this would take another six to nine months to organise. Visitor numbers had doubled over the past three years to reach 1 million tourists, with 2 million expected for this year, but the flow has now dwindled to a trickle, he said. “It is high season now yet the hotels are empty,” he said. The irony is that the romantic beach resorts on the Indian Ocean and breathtaking safari parks for which Kenya is so famous have been largely unaffected by the violence. Many of the resorts are set in their own grounds, miles away from the conflict areas. Tea production, another vital industry, has also been affected. Kenya took over from Sri Lanka as the world’s largest exporter of tea in recent years, but this position could be under threat as farmers struggle to transport their produce. The consumer goods giant, the largest tea company in the world, employs more than 18,000 at its tea plantation in Kericho in the Rift Valley, and accounts for 11 per cent of Kenya’s tea market. The tea estates, home to people from lots of different tribes in Kenya, were invaded by rioting youths. Tragically, 15 people were killed on the estates, 11 in ethnic clashes and four shot by police trying to protect the workers. A further 3,000 employees, fearful that more rioters would enter the plantations, wished to return to their tribal homeland, and Unilever, helped by volunteers in the local community offering transport, escorted them home. Dry weather has also hampered tea production. Combined with the disruptions, this has meant tea prices rising by 20 per cent. But although tea production has continued at the plantation, with temporary workers making up the shortfall, it is difficult to get enough lorry drivers willing to make the long journey to Mombasa at night, even with police escorts. Those that do get to Mombasa encounter a considerable backlog. Not far from the tea plantation lies the heart of Kenya’s flower industry, which produces fresh-cut blooms that are delivered to British supermarkets. The sector employs more than 20,000 people, and December to March is the peak export season, with St Valentine’s Day a key date for growers. Roses make up 74 per cent of Kenya’s flower exports, followed by carnations, the most popular flower in Britain. The industry is estimated to have lost £18m in just one week after export company staff were unable to travel to work due to tribal violence. Exporters also incurred losses due to inflated airfreight charges after airlines stopped flying to Nairobi. The aggression has largely been aimed at the Kikuyu community, to which President Kibaki belongs. The Kikuyu dominate economic life in Kenya and it is their businesses that have been targeted, taking a lot of dynamism out of the economy. Barclays, the biggest bank in Kenya, has announced plans to relax repayment schedules for some customers on a discretionary basis as bankers believe businesses affected by rioting and looting may default on loans. Kenya was an African success story. 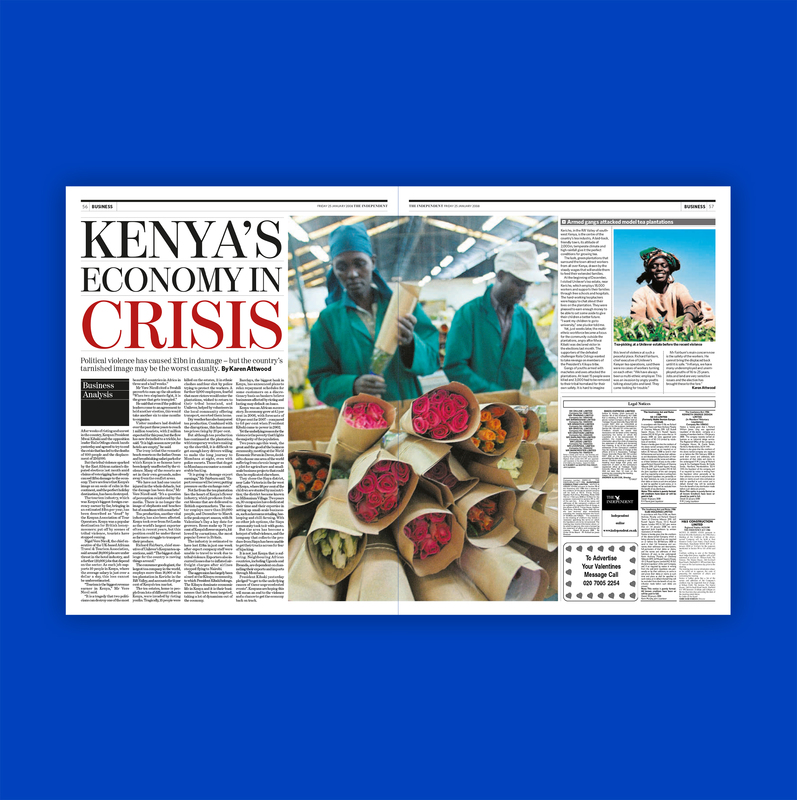 Its economy grew at 6.1 per cent in 2006, with forecasts of 6.9 per cent for 2007 – compared to 0.6 per cent when President Kibaki came to power in 2002. Yet the underlying reason for the violence is the poverty that blights the majority of the population. Two years ago this week, the great and the good of the business community, meeting at the World Economic Forum in Davos, decided to choose one area of the world suffering from chronic hunger as a pilot for agriculture and small-scale business projects that could then be replicated elsewhere. They chose the Siaya district, near Lake Victoria in the far west of Kenya, where 38 per cent of the children are stunted by malnutrition; the district became known as Millennium Village. Two years on, 30 companies have dedicated their time and their expertise in setting up small-scale businesses, such as kerosene retailing, beekeeping and chilli farming. With no other job options, the Siaya community took to it with gusto. But the area has become a hotspot of tribal violence, and the company that collects the produce from Siaya has been unable to get their trucks across for fear of hijacking. It is not just Kenya that is suffering. Neighbouring African countries, including Uganda and Rwanda, are dependent on channelling their exports and imports through Mombasa. President Kibaki yesterday pledged “to get to the underlying causes of these unprecedented events”. Kenyans are hoping this will mean an end to the violence and a chance to get the economy back on track. Kericho, in the Rift Valley of south-west Kenya, is the centre of the country’s tea industry. A laid-back, friendly town, its altitude of 2,000m, temperate climate and high rainfall give it the perfect conditions for growing tea. The lush, green plantations that surround the town attract workers from all over Kenya, drawn by the steady wages that will enable them to feed their extended families. At the beginning of December, I visited Unilever’s tea estate, near Kericho, which employs 18,000 workers and supports their families through free schools and hospitals. The hard-working tea pluckers were happy to chat about their lives on the plantation. They were pleased to earn enough money to be able to set some aside to give their children a better future. “I want my children to go to university,” one plucker told me. Yet, just weeks later, the multi-ethnic workforce became a focus for the community outside the plantations, angry after Mwai Kibaki was declared victor in the elections last month. The supporters of the defeated challenger Raila Odinga wanted to take revenge on members of the President’s Kikuyu tribe.